I have a number of these cracker jars in my auction database going back to 2003, none with lids. One in marigold and with a hairline crack sold in 2007 for $400. 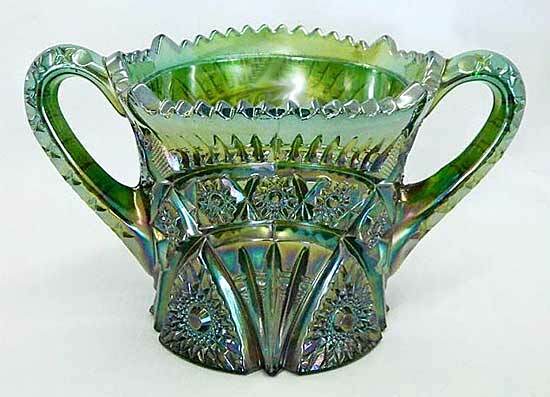 This green example sold at the 2012 International Carnival Glass Association convention auction for $450. In 2013, another green example sold for $190. In 2017, two more lidless examples in green sold for $100 and $250. One wonders if they ever came with lids, but were intended for something other than crackers or cookies. Photo courtesy of Seeck Auctions. It's worth pointing out that in 2018 a marigold cookie jar with a crystal lid sold for $200. So apprenty the pieces came with lids.